The coldest weather I’ve ever experienced occurred January 30-31, 2019. Here in Dodgeville, Wisconsin, I measured a low temperature the morning of Wednesday, January 30, 2019 of -31.0° F and a high that day of -14.4° F. It was even colder the following night. On Thursday, January 31, 2019 the low temperature was -31.9° F.
Thanks to the National Weather Service, we had advance notice of the arrival of the Arctic polar vortex that was to bring the coldest weather to Wisconsin in a generation. Concerned about the effect this would have on my observatory electronics, I started running my warming room electric heater continuously from 8:30 p.m. CST Monday, January 28 until 9:45 a.m. CST Friday, February 1. Of course, I left the warming room door open to the telescope room to ensure that some of the heat would reach the telescope and its associated electronics. During this time, I made a number of temperature measurements from an Oregon Scientific weather station inside the house, connected by 433 MHz radio frequency signals to temperature sensors inside the observatory and on the north side of my house. Air (north side of house) and Observatory (inside the observatory) temperatures January 28-February 1, 2019. There seems to be a general trend that the colder it was outside the observatory, the bigger was the temperature difference between inside the observatory and outside the observatory. Why is that? The electric heater is presumably putting out a constant amount of heat, so you might think that the temperature difference would remain more or less constant as the temperature goes up and down outside. It doesn’t. There are a number of factors influencing the temperature inside the observatory. First, there is the thermal mass of the observatory itself, and some heating of the inside of the observatory should occur when the sun is shining on it. There is the wind speed and direction to consider. There may be some heating through the concrete slab from the ground below. It seems to me that thermodynamics should be able to explain the general downward trend in ΔT as the outside air temperature increases. Can you help by posting a comment here? You’ll notice three outliers in the graph above where ΔT is quite a bit lower than the regression line. The points (-22.0,16.6) and (-10.5,10.1) were consecutive measurements just 76 minutes apart (8:32 a.m. and 9:48 a.m.), the first readings I made after the lowest overnight temperature of -31.9° F on 1/31. The point (8.2,7.6) was my first reading on 1/28 at 8:42 p.m., soon after turning the space heater in the observatory on. The points (-16.4,25.2), (-17.9,26.0), (-19.5,26.3), (-25.1,27.2), and (-26.9,27.4) all are above the regression line and are consecutive readings between 8:29 p.m. on 1/29 and 3:20 a.m. on 1/30 before the -31.0° F low on the first really cold night. 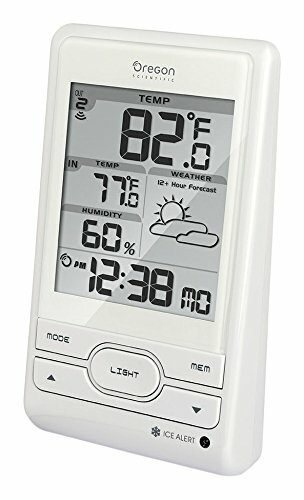 My weather station keeps track of the daily high and low temperatures, but not the time at which those temperatures occur. On 1/30 when the outside low temperature of -31.0° F was recorded, the low inside the observatory was -4.0° F (though not necessarily at the same time). ΔT = 27.0°. The high temperature that day was -14.4° F and 6.4° F inside the observatory (ΔT = 20.8°). The next night, 1/31, the low temperature was -31.9° F and -6.2° F inside the observatory (ΔT = 25.7°). So, despite the many factors which influence the temperature differential between outside and inside the observatory, the clear trend of smaller ΔT at warmer outside temperature begs for an explanation. Can you help?